↑CSF with gait, urinary and mentation symptoms. Periventricular CSF (not global) so sacral (bladder and leg) motor fibres affected. CT in NPH - classically ↑ ventricular vol. Altered gait is often the first symptom. Classically "magnetic" gait (feet stuck to the floor). ±pyramidal tract signs (e.g. ↑tone/spasticity), particularly of legs. Urinary symptoms = detrusor over-activity (periventricular pathology). Dementia - characteristic loss short term recall. Normal ICP (but ↑vol) = No papilloedema & normal opening pressure (LP). Parkinson’s (rest tremor is unusual in NPH). 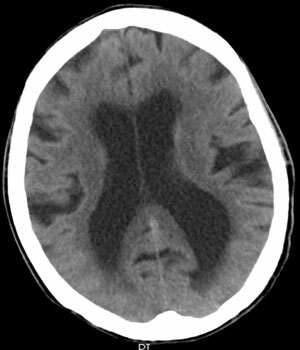 CT brain (very sensitive so a normal CT rules NPH out). MRI is more specific (positive rules NPH in). Diagnostic LP with CSF volume (>50ml) drainage (NPH will respond). Vascular/inflam. dementia work-up (in-patient teams). Levodopa trial if ?Parkinson’s (NPH will not respond). Admit Care of the Elderly for dementia / CSF shunt work-up. Content By Dr Íomhar O' Sullivan 12/03/2019. Last review Dr ÍOS 13/03/19.